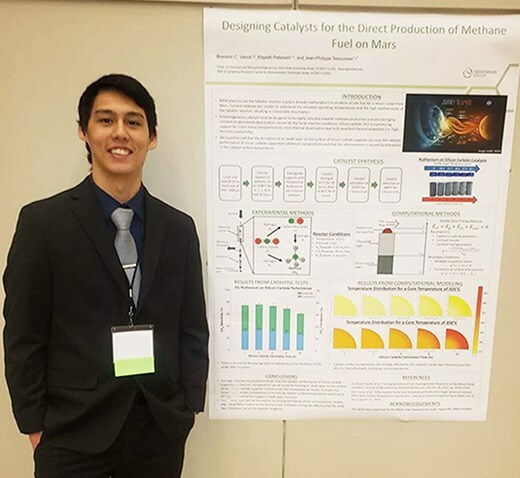 On April 30, 60 teams from colleges and universities across the nation will participate in the 2019 Posters on the Hill event, sponsored by the Council on Undergraduate Research (CUR) with support from the American Chemical Society (ACS) and Institute of Electrical and Electronics Engineers-USA. Researchers and faculty members from as far away as University of Alaska Fairbanks, Norwich University (VT), and University of Wyoming will join local peers from George Mason University and Virginia Commonwealth University to share their research on topics ranging from fuel that can power a spacecraft from Mars and cancer research to systems for determining the fastest commuting route and identifying remains of missing POWs (read the poster abstracts). The poster session will take place in the Rayburn Cafe of the Rayburn House Office Building on Capitol Hill from 5:15 to 7:30 pm on April 30. CUR, in collaboration with ACS and other entities, holds the annual Posters on the Hill event to highlight the work of undergraduate researchers from across the country to Members of Congress, congressional staffers, federal government officials, academics, and others, demonstrating the value of federal investment in undergraduate research. The event is highly selective—institutions’ most talented researchers are judged by a national panel of experts in their fields, and only the best teams are chosen for the poster session on Capitol Hill. Past participants have gone on to contribute significantly to the research enterprise, such as Sarah Caudill, a gravitational-wave scientist at Nikhef who was part of the “discovery of the century” team that discovered gravitational waves. Read more about the posters and presenters.